The problem: too many buttons. And, no one likes a babysitter. There are many of social sites out there. Way too many. And new ones are popping up daily. The reason why no-one has consolidated this mess is that most people immediately think that centralisation is the only way to go: they think that you need a central server of some kind, so that you register and and log in to this central server and set up your preferred social site. Then, the blogosphere would only need to embed a single button on every post, which would open up this uber site (or ask it about your preference) so that the link could be dispatched to all your friends. And the problem with this scenario is that no-one likes a central uber server. It’s a single point of failure, and more importantly it is like having a babysitter around. Not everyone likes Gmail. Or Yahoo. Some people even prefer Hotmail(!). And what’s more, most people have multiple email addresses, and they don’t all stick to the same provider. No mess, no fuss. Just enter your friend’s email, and click Send. No need to have an email button for every bloody email provider on the planet embedded on the webpage. The solution: a new link type for social sharing? and all you have to do is click Send. Even less mess, even less fuss. explosion of buttons in the future? Well, since “like”-ing something is similar to “share”-ing it (or ****-ing it, or whatever) you should be able to share or like or **** the item through the application’s interface. 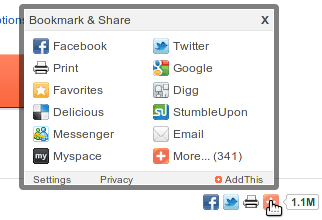 The webbrowser only needs to know that you want to share it, not how. Therefore there is no need to think up new links for every kind of service a social site provides. The proposed “sharethis” link-type is only a means to bridge the ever-widening gap between seeing something online and ultimately (and painlessly) sharing it with your friends. To be fair: addthis‘s solution is not wrong, per se. But there are just too many buttons! And as is the case with google’s “preview on mouseover”, having boxes of crap pop-up and and obscure / distract me from the things I want to read is simply annoying. the mailto link-type was not really an answer to this kind of problem, since the problem didn’t exist at the time: there was no such thing as gmail or yahoo mail back in the day, and the only way to send an email was to have the web-browser launch a seperate emailling application in order to send email. Of course, this was until jwz and the gang implemented an email application *inside* their webbrowser, which was not a good thing, depending on who you ask. The key here is that most (if not all) email programs can be set up to send email from any kind of email account that supports at least one of two popular protocols, POP3 and IMAP. You are free to use Gmail (for example) from any kind of email application! Yes, you say, but social sites don’t like desktop apps. Not true, I say. Twitter *loves* them. Even Facebook, although they want you on their website, will rather have you post something from *somewhere* than not take part in the FB experience at all. Both TweetDeck and RockMelt are perfectly capable of interacting with Facebook at a distance. Of course RockMelt aready does this kind of thing, being a social browser. But the point is to standardise it to *other* browsers as well. After all, choice (of browser and sharing progam) is good, yes? I’ve been tasked with adapting lwip to a Xilinx-based MicroBlaze processor at work, and finally got it to a point where I can ping the devboard, telnet into it and load simple webpages from it. All this was done with a static IP, but of course any embedded device worth its salt needs to be able to acquire a dynamic IP. This is fairly easy to activate in lwip, provided that the rest of the framework is interacting well with the custom-written Ethernet driver. The proof is, however, in the puddingtesting: I didn’t have a spare router or anything lying at work though, and didn’t want to risk plugging the devboard into the office LAN (and thereby potentially bringing down the office network at 5pm). I tried in vain for a while to configure my desktop (a Mac) to enable DHCP on it, but then gave up. It seems that tools you pay for is really hard to use, especially if you want it to do something that doesn’t have a cute little icon in the “System Preferences” dialog. So instead I fired up my personal linux laptop, installed dhcp3-server via apt, and voila! the devboard leased an address and it was up and running! Blu-ray player, the unit can also play stuff from a home network. Correction: it *can* play stuff from the home network, if I could run ethernet cabling to the unit. options sound like what I would like to do. So I looked through my box of discarded toys, where I found an old Belkin wifi router. the settings (via a very nicely laid-out web gui) so that the router now acts as a bridge. I recently did a course on flexible insulin management using carb counting, called FlexIT. It is run by the Baker IDI Heart and Diabetes Institute here in Melbourne. It is an enlightening experience, to say the least, for this 27-year diabetes patient. So here’s a question I’d like to throw out there on the interwebs: Do you know of similar courses that are run in other parts of the world? My dad has just asked me whether I know of such a course in Norway (since an acquaintance of his asked about it), but after looking around on google and wikipedia I could only find mention of DAFNE, which seems to be UK (and also Australia) based, and some mentions about such courses in the USA, but not really anywhere else. So are there any Norwegians out there who know differently? Or for that matter, anyone elsewhere in the world? Ok, so here is the slashdot story: Crime Expert Backs Call For “License To Compute”. As always, read the friggin’ original article first. Done? Please proceed. When I saw this, my initial reaction was “the Australian government and their cyberidiocy, at it again”. But then I double checked, thought about it, and changed my mind. The keyword in the article is EDUCATION. Sure, requiring that people earn a Computer License is absurd. But what if we actually push for regulation that forces more people to undertake some kind of educational program? Giving people a secure browser, and sending them out into the wild does not make it safer for them without telling them how to use it properly, first. Questions: How much harder can we make it for the crims to get hold of credit card numbers when people are more informed. Depends on the degree of informed, I guess? Also, criminals adapt; make it harder for them to get what they want and they will only try harder in return. But it is a start. Also, what kind of regulation would actually be beneficial? Requiring that everyone take some kind of course at school? The most vulnerable people are not in school anymore! How about this: pass regulation that if a person is caught up in a cybercrime fraud, that they take full responsibility (ie. the bank does not have to cover for them) unless they take such a course.